Today I’d like to share a couple of graphics programs that have made a huge difference for me. Built in share options to Instagram, Twitter, Facebook, Tumblr, Pinterest, Text, or E-mail. “Canva makes design simple for everyone. Create designs for Web or print: blog graphics, presentations, Facebook covers, flyers, posters, invitations and so much more.” Canva is much more flexible than Wordswag, but it will take longer to get a graphic designed. Choose from presized canvases for social media, poster, presentation, Facebook cover, Facebook post, etc. What have you learned in the past year that has helped you in your writing? 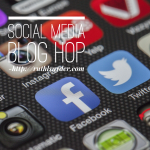 Note: If you’re interested in participating in the social media blog hop and want an e-mail reminder, send me an email and I’ll add you to the list.